Miles Ritherford's team have clinched top spot with three games left and can now, barring any unforeseen problems, look forward to promotion to the Bostik League for the 2019-20. They made sure of the title with a 2-0 home win over Langney Wanderers that sparked jubliant scenes at Oaklands Park. You can't say they don't deserve it. City, with Rutherford, his No2 Graeme Gee and coach Danny Potter at the helm, have been strong all season and have been top for weeks - slowly extending their lead with a relentless run of form that their rivals have had no answer to. They've won an amazing 80 per cent of their games - 28 out of 35 played so far, with only four draws and three defeats breaking up their succession of victories. 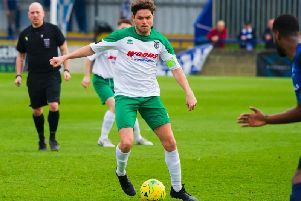 The win against Langney that got the title party started came from Scott Jones - and how fitting that the man whose goals have led the City charge this season - and Emmett Dunn. Congratluations have been pouring in from fans, other clubs and former City figures.